Recently, I needed to buy a new foundation and decided to swap out my usual Clinique for a drugstore brand. But having not bought a different brand in so long, I didn’t know what to choose. So naturally, I picked up my smartphone and began browsing the web for suggestions! This process got me thinking about how much beauty product marketing has changed over the past decade. Research has shown that the average consumer consults many more sources of information and a majority of those are online. While a few years ago, we may have been more swayed by an ad in Cosmopolitan, now we probably consult many beauty blogs and online reviews before making a decision. But with so many sources out there, how do you make your content and your product stand out? Informed by my own beauty buying experience, here are some top tips for optimizing your content and getting your product in front of searching customers. If your beauty content is buried in the 9th page of a search for “best drugstore foundation”, it’s unlikely any consumer is going to see it after already reading article after article about the best brands. Optimizing your content for search engines makes it easier for consumers to find your content and know it is the most relevant to their search. You can do this organically, by bidding on keywords, or by buying ad space. 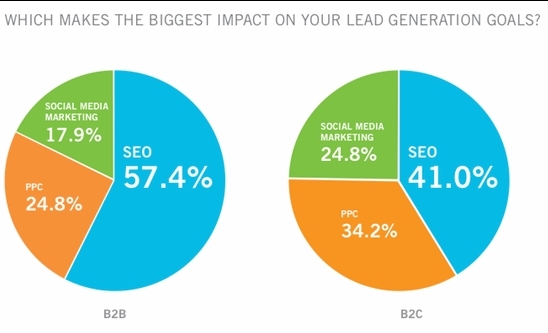 The chart below illustrates just how important SEO is for B2B and B2C companies. As I mentioned, I saw that sponsored post on Facebook before I was even looking for a foundation. When I did begin my search, it was the first product on my mind. Your audience lives on social media so why not meet them there? Research has shown that they are likely to be responsive to brands on these networks. Use your social accounts to blast your content to larger audiences and enter consumers’ paths without being intrusive. The beauty industry has a particularly excellent opportunity to be successful with content marketing. However, just like with any other medium, there is a lot of noise to break through. With these tips in mind, you can stand out by delivering top quality content while effectively promoting your brand and services. You’ll be the first one they think of when they run out of foundation!